Heat oven to 375°F. Line cookie sheet with parchment paper. Separate or cut dough into 4 (4x7-inch) rectangles; if using crescent roll dough, firmly press perforations to seal. Sprinkle 1 tablespoon of the granulated sugar on cutting board. Place 2 dough rectangles on sugar; press lightly. Brush both tops of dough with about 1 tablespoon butter; sprinkle with 1 tablespoon sugar. Place one rectangle on top of another; tightly roll both short sides of the dough rectangle so they meet in the middle. Using a serrated knife, cut each roll into 8 slices. Place cut side down, 2 inches apart, on parchment-lined cookie sheet. Sprinkle with coarse sugar. Press each slightly to flatten. Bake 10 to 13 minutes or until golden brown. Cool 1 minute; remove from cookie sheets. Cool completely. Instead of (or in addition to) the granulated sugar, try these variations: cinnamon and sugar or citrus zest and sugar. 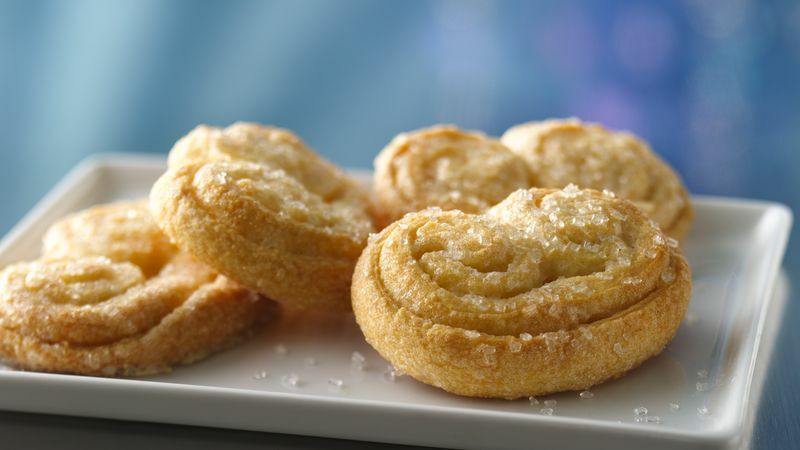 Palmiers keep in an airtight container at room temperature for up to 4 days. If desired, palmiers can be recrisped in a 300°F oven until heated through, about 5 minutes.